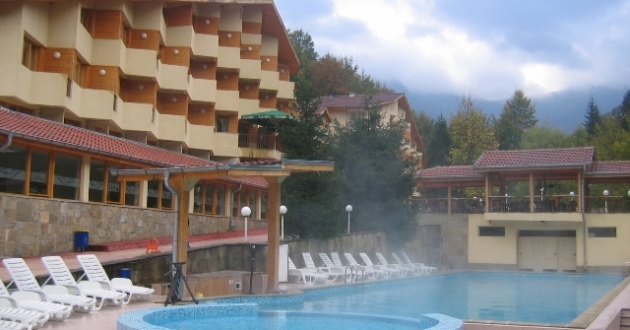 Location: Diva hotel complex is located in the picturesque Chiflik village, Stara Planina Mountain, 15 km away from the town of Troyan. Accommodation: The hotel offers 35 double rooms, 5 apartments and 2 suites with fireplaces. All the rooms are with new furnishing and have telephone, mini-bar, TV and balcony with view to the swimming pool. In the hotel: Restaurant, tavern, BBQ, lobby bar and water bar, conference hall. SPA facilities: rehabilitation centre, swimming pool with rich mineral thermal water, Jacuzzi, pearl bath with boiling pears of bubbles, aromatic baths with essential oils, etc; SPA therapy - antistress therapy; thalasotherapy - combining all the priorities of sea water; sauna and sauna therapy; solarium, hot stone massage, cosmetic center. The water temperature is permanent all year long - 34 degrees Celsius.